Re-reading the Fantastic Four comics from the start. This week, it’s annual #5, which actually takes place before the issues I wrote about last week. Oh no, continuity is all out of whack now. The story begins as Sue mysteriously faints. Or, as Ben puts it, “She just went kerplunk!” She wakes, and insists she’s fine. Ben then takes off his jetcycle to go visit Alicia. We go from there to a “carefully-locked, completely soundproofed building,” where the evil Psycho-Man is displeased with one of his henchmen. The goon delivered a component to the wrong address, and now must be punished. Psycho-Man announces that he is the master of all emotions. He sets his Pyscho-Ray to “fear,” and causes the guy to have terrifying hallucinations. We then meet Psycho-Man’s other three henchmen, Live Wire, Ivan, and Shell Shock. Live Wire, who is dressed as a cowboy, tries to rebel with his electric pistol and electric lariat, but Psycho-Man’s armor to too strong for him. He sets the Pyscho-Ray to “doubt,” thus ruining their self-confidence and making them loyal to him. Ben is at Alicia’s place, where a mysterious package has been delivered. He can’t get it open. Something zaps him in the back, and then, out of nowhere, a big green monster attacks him. He fights it, only to have it knock him out. Sure enough, this was an attack by Psycho-Man, who blasted Ben and Alicia with the “fear” setting. Turns out this package is what the henchman accidentally delivered. (So, this is all just a big coincidence?) Psycho-Man exposits that he plans to use this component to build a giant Psycho-Ray that can control the emotions of the whole world, making him ruler, etc. From there, we go to the beach at “Panther Island,” which we’re told was recently purchased by the Black Panther, and I guess is now part of the Wakandan nation. Or is Wakanda on the African coast? Anyway, the Black Panther and some of his men are on patrol after hearing reports of intruders on the island. Nice to see the country’s ruler taking a hands-on approach like this. He runs into Medusa and Karnak of the Inhumans, and there’s a heroes-mistake-each-other-for-enemies fight until Black Bolt breaks them up. The Inhumans are there to investigate a strange rock formation near the island. Black Bolt flies out there and creates a bridge for the rest to follow. He does this by revealing a new power of his – the ability to manipulate molecular energy. Sure, why not? On the big rock, Karnak discovers a mysterious dome, which propels him backward with an energy blast. Ben and Alicia rejoin the rest of FF. He’s anxious to go after Psycho-Man, apparently having overheard the baddie’s plan. Reed delays the fight against evil for a big announcement: Sue is preggers! Yep, a baby’s on the way, and everyone’s happy about it, with Ben doing the “I’ll be like an uncle,” gag, emphasizing how these characters have become like family. Reed says this is why he doesn’t want to go off and fight Psycho-Man, because he doesn’t want to endanger the baby. Ben says that’s not going to stop the rest of them. At Psycho-Man’s secret headquarters, he tells his goons that their location has been discovered. Turns out their base is the dome being investigated by Black Panther and the Inhumans. Time for fighting! This Ivan guy shoots Black Bolt with his “solar-pistol.” Shell Shock’s deal is that he can fire miniature hunter-missiles. The missile chases Black Panther around, but he does that thing where he leads it back to the guy who fired it and jumps out of the way at the last second. 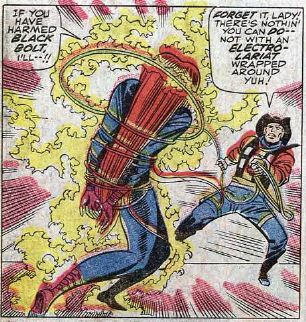 It’s Live Wire who proves to be the real trouble for the good guys, wrapping up Medusa in his electric lariat. He puts up a good fight against Karnak, but Karnak finds Live Wire’s weakness and takes him out. None of this distresses Psycho-Man, who is almost done building the giant ray. Black Panther and the Inhumans are joined by Ben, Johnny and, for some reason, the Inhuman Triton, who arrive courtesy of Lockjaw, the Inhumans’ teleporting dog. Lockjaw hangs back, and the seven heroes enter Pyscho-Man’s dome, where they’re attacked out of nowhere by a huge yellow tentacle monster. Everybody fights it, but it appears too strong to be defeated. 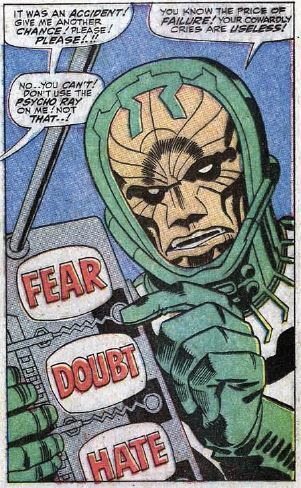 Karnak tries to break through the wall to get at Psycho-Man, but the wall comes alive and entangles him. Black Panther tries to get at Psycho-Man through the air ducts, but is attacked and overpowered by a caveman-like creature. Outside, the Inhuman Gorgon shows up, because there aren’t enough guest stars already. He finds the tentacle monster cornering Johnny and Medusa. With a single stomp of his mighty feet (his mighty hooves? ), Gorgon creates a shockwave that makes the monster vanish. (Now would be a good time to remind everyone that Gorgon once singlehandedly defeated the entire FF.) Similar shock waves free Karnak and Triton. Everyone figures out what the reader already realized, that these attacks are the result of Psycho-Man’s ray. Gorgon’s shock waves are for some reason the only thing that can stop Psycho-Man’s illusions. After regrouping and smashing through some walls, the heroes finally confront Psycho-Man. 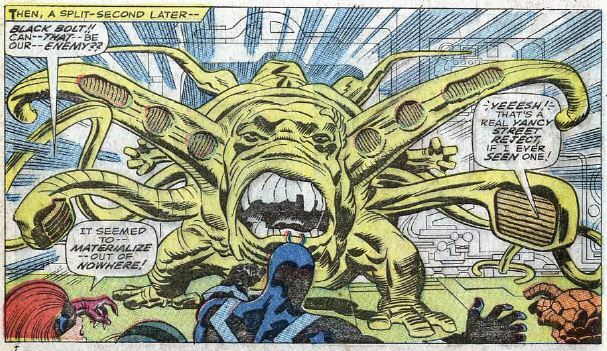 Black Bolt destroys the giant ray, but Psycho-Man still has his hand-held one. Unstable molecule/Fade out: Reed and Sue barely appear in this one, despite the historically important announcement. This also (retroactively) explained why she stayed away from the action in issues #66-67. 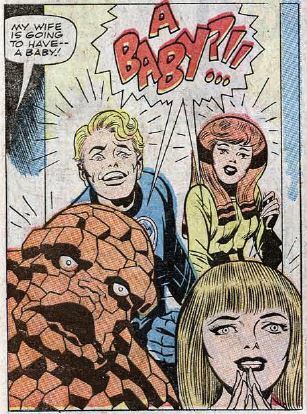 Clobberin’ time: Ben is in good spirits upon learning he’ll be an “uncle,” and, without Reed around, he takes a leadership role in the fight. Flame on: With all these guest stars running around, poor Johnny isn’t given much to do. Commercial break: You can have a he-man voice! Trivia time: This annual came with two back-up stories. The first was a Silver Surfer solo story, in which met Quasimodo, from annual #4, still a brain trapped inside that computer. The Surfer, in his naiveté, uses the power cosmic to give Quasimodo a real body. Then Quasimodo goes on a rampage, as is his wont, forcing the Surfer to stop him, this time by turning him into stone. The second back up story is a gag comic about Stan and Jack horsing around at the Marvel offices. It’s kind of unreadable, to be honest. 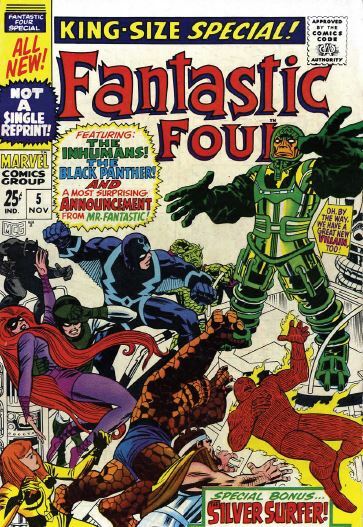 There’s also a bunch of great Jack Kirby pin-ups of the FF and the Inhumans. Fantastic or frightful? This is really an Inhumans/Black Panther team-up story. If it wasn’t for the announcement that Sue is pregnant, there wouldn’t a need for the FF to be in this issue at all. Still, the action is pretty great, with Kirby monsters and Kirby destruction.